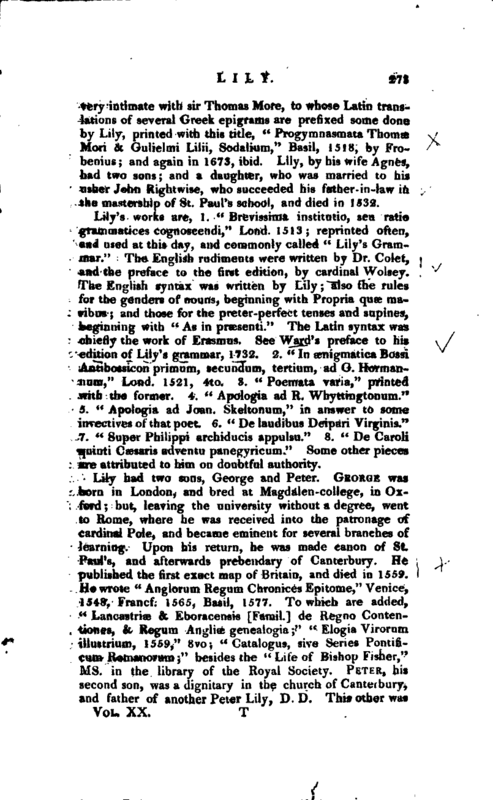 , an eminent English grammarian, was born at Odiham, in Hampshire, about 1468. After a good foundation of school-learning, he was sent to Magdalen -college, Oxford, and admitted a demy there at the age of eighteen. Having taken the degree of B. A. he quitted the university, and went, for religion’s sake, to Jerusalem, as Pits, and after him Wood, Tanner, and others have asserted; but Bale, from whom Pits copied, gives no such reason for Lily’s journey. 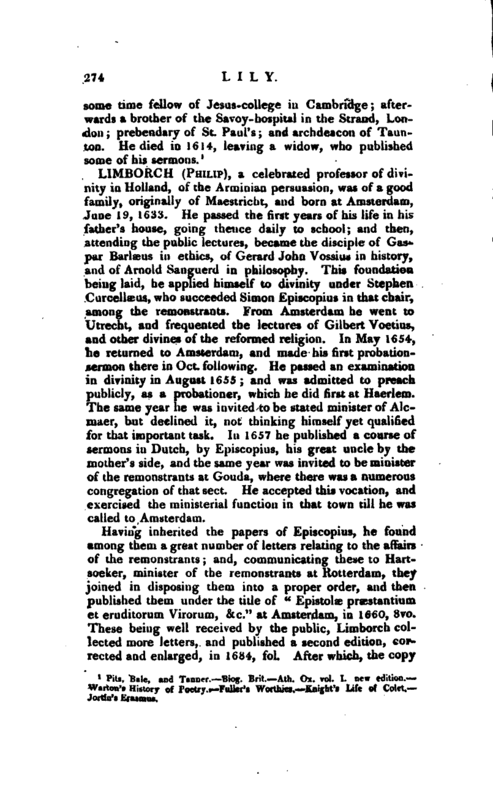 It is indeed most probable, that he travelled eastward with an intention to acquire some knowledge of the Greek language, especially as he continued five years in the island of Rhodes with no other design. At Rhodes he found several learned men who had taken refuge there, under the protection of the knights, after the taking of Constantinople; and here he became acquainted with the domestic life and familiar conversation of the Greeks. He went thence to Rome; and improved himself farther in the Latin and Greek tongues under John Sulpitius and Pomponius Sabinus. On his arival in England, in 1509, he settled in London, and taught a private grammar-school, being the first teacher of Greek in the metropolis. In this he had so much success and reputation, that he was appointed first-master of St. Paul’s school. by the founder, Dr. Culet, in 1510. This laborious and useful employment he filled for the space of twelve years; and in that time educated a great many youths, some of whom proved the greatest men in the nation, as Thomas Lupset, sir Anthony Denny, sir William Paget, sir Edward North, John Leland, &c. He died of the plague at London in February 1523, aged 54, and was buried in the north yard of St. Paul’s. He is highly praised by Erasmus for his uncommon knowledge in the languages, and admirable skill in the instruction of youth. He was | very intimate with sir Thomas More, to whose Latin translations of several Greek epigrams are prefixed some done by Lily, printed with this title, “Progymnasmata Thorns Mori & Gulielmi Lilii, Sodalium,” Basil, 1518, by Frobenius; and again in 1673, ibid. Lily, by his wife Agnes, had two sons; and a daughter, who was married to his usher John Rightwise, who succeeded his father-in-law in the mastership of St. Paul’s school, and died in 1532. Lily’s works are, 1. “Brevissima institutio, seu ratio grammatices cognoscendi,” Lond. 1513; reprinted often, and used at this day, and commonly called “Lily’s Grammar.” The English rudiments were written by Dr. Colet, and the preface to the first edition, by cardinal Wolsey. The English syntax was written by Lily; also the rules for the genders of nouns, beginning with Propria quse maribus; and those for the preter-perfect tenses and supines, beginning with “As, in prsesenti.” The Latin syntax was chiefly the work of Erasmus. 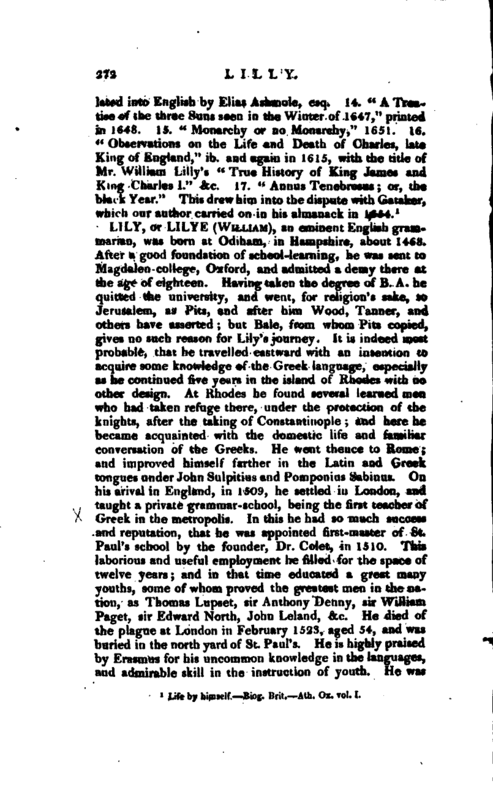 See Ward’s preface to his edition of Lily’s grammar, 1732. 2. “In senigmatica Bossi Antibossicon primum, secundum, tertium, ad G. Hormannum,” Lond. 1521, 4to. 3. “Poemata varia,” printed with the former. 4. “Apologia ad R. Whyttingtonum.” 5. “Apologia ad Joan. Skeltonum,” in answer to some invectives of that poet. 6. “De laudibus Deipari Virginis.” 7. “Super Philippi archiducis appulsu.” 8. “De Caroli quinti Caesaris adventu panegyricum.” Some other pieces are attributed to him on doubtful authority. 1 Pits, Bale, and Tanner. Biog. Brit. —Ath. Ox. vol. I. new edition. Warton’s History of Poetry. Fuller’s Worthies. Knight’s Life of Colet. Jortin’s Erasmus.